A new study from the National Renewable Energy Laboratory (NREL) shows the quality of biodiesel has made significant gains from just a couple of years ago. During a session completed just moments ago at the 2008 National Biodiesel Conference and expo here in Orlando, Fla., Teresa Alleman, a senior chemist with NREL says 90 percent of the biodiesel her lab tested met national fuel quality standards. “We hit some of the most important (specifications) for engine operability, and we were able to sample about 70 percent of the producers in the market. The high success rate of meeting the specifications is good news for the industry,” Alleman said. She says they tested specifications such as flash point, free and total glycerines, metals, water and sentiment levels, and oxidation stability… just to name a few. Alleman says a previous test in 2005 showed a 15 percent failure to meet specifations and 59 percent off specifications in 2006… although she points out the 2006 number was from jobbers and terminals, not at the producer level. 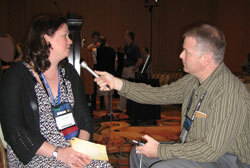 She hopes this new report will give consumers more confidence in biodiesel.